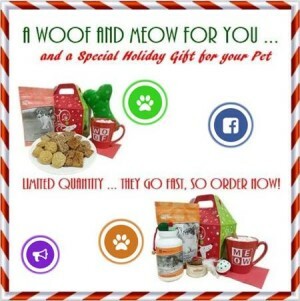 We are giving away 2 Holiday Pet Gift Boxes via our Facebook page! You’ll find this post pinned at the top of our Facebook page here or click the image below to get there! To get a chance at winning, all you have to do is Like, Comment or Share Publicly this post ON OUR FACEBOOK PAGE (not here). Each action gets you 1 entry! We’ll pick 2 random winners with the MOST actions on Tuesday, December 15, 2015 at noon EST. If we sell out of these prior to end of this contest, winners will receive $20.00 Gift Certificate. USA residents ONLY! Again, you’ll find this post pinned at the top of our Facebook page here or click the image above to enter now!